The Masterbox lamp from Gamewell-FCI uses same die-cast aluminum shell produced today for Masterboxes. Located behind the front pull-down door, the on/off switch for this 110V lamp is a replica of white alarm lever. A three-way switch is also included at the base of the bulb. 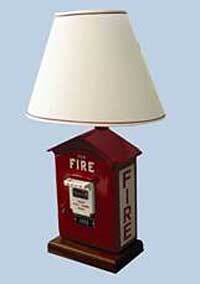 The lamp uses a standard three-way bulb and comes with an white shade with red trim.